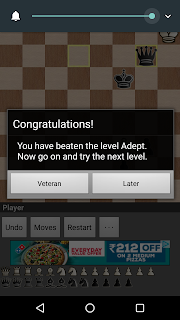 Chennai, February 3, 2018 - After more than two years of battling it out with the Chess Free app in Adept mode, area man Rajesh Jayaprakash finally clinched his first victory. "Well, technically my first victory, as I had forced the $#&% computer to sue for peace by the threefold-repetition rule sometime back", a visibly elated Rajesh said. Asked how he felt after this momentous achievement, he mentioned a feeling of relief and a surge of self-confidence. Reliving the moment immediately after 74. ... Qb2#, he added that it was actually quite anticlimactic, since victory was assured ten moves earlier when his King captured the enemy Rook on d8, as the game then became a checkmate-with-King-and-Queen ending. "Although, to be fair, you still need to finish White off", he added with a nervous laugh, with his thoughts already turning to his next battle of wits with the computer. At the time of going to press, Rajesh was observed peering intently at his phone, replaying the entire game for the 13th time on Analyze This, his favourite chess analysis app, with a triumphant smile breaking out on his face each time his Queen checkmated the opposite King on move #74. Jokes aside--that was my poor imitation of The Onion, in case you didn't know--, I thought I'd record my first victory for posterity. 1. e4 e5 2. f4 exf4 Adopting Korchnoi's maxim of never refusing material. 3. Nf3 Nc6 4. Nc3 d6 5. Bb5 Bd7 6. d4 g5 Goodbye to kingside castling, let's see how far we can go to defend the f4 pawn. 7. h3 Bg7 8. O-O Hmmm, he doesn't seem to mind castling without sufficient pawn cover, maybe I should as well and avoid a Queenside pawn storm. 8. ... Nge7? Hanging the g5 pawn. 9. d5 On first glance, it's surprising the g5 pawn doesn't get captured, but 9. Nxg5 Bxd4+ is good for black, especially since 10. ... Bxc3 screws up White's pawn structure. 9. ... Ne5? Aaannd we shoot ourselves in the foot, blocking Bxd4+. 10. Nxg5 N7g6 Attacking the Knight with our Queen, and also eyeing h4 for our Knight. 11. Qh5 h6 12. Nf3 Nxf3+ 13. Qxf3 Be5 Providing support for our lonely f4 pawn. Also, e5 is a solid square for our Bishop, as it's not possible for White to threaten it with a pawn. 14. Bxd7+ Qxd7 15. Bd2 O-O-O 16. Kh1 f5 The f7 pawn will become a long-term liability, might as well exchange it for a central pawn. 17. Qf2 Kb8 Sneaky move by White to take on a7 and finish the game quickly. We're too clever for this. 18. exf5 Qxf5 19. Nb5 b6 You'll not give up, will you? 20. c3 Removing the pawn from danger, also shielding the b2 pawn from the Bishop. 20. ... Rdf8 Shoring up support for the f4 pawn. 21. Rac1 h5 22. Qe2 h4 The White Queen is up to something, but h4 is an excellent square for our pawn: we now have iron control over g3. 23. Qc4 Qd7 Attempting Qxc7+ followed by Qxa7#. Duly thwarted. 24. Qc6 Qc8 Sorry, we're not ready for the exchange. Not to mention losing the b7 square to the White pawn. 25. Qc4 f3 Now we're talking. Time to up the pressure on White's kingside pawn structure. It also helps that our Queen is off the f-file where there was the danger of being exposed to the Rook. And the game is pretty much over. Still need to finish it though. 32. ... Qg8+ 33. Kf1 Qxd5 34. Nd4 Qh1+ 35. Ke2 Qxh3 Here's where the power of the Queen shines through, slicing through White's pieces. Ser Arthur Dayne would approve (and here were nay-sayers doubting my ability to sneak in a Game of Thrones reference). 36. Rf2 Qg4+ 37. Kd3 Kb7 Never hurts to insulate our King from pesky checks by the Rook. Also, you will notice that the King is pretty safe from the White Knight as well, as the only safe place it can check the King from is d8, which is a long way off. 38. a3 h3 Proceeding to promote the pawn. 39. Ke3 Qg5+ 40. Kf3 Qg1 41. Nf5 h2 42. Ng3 h1Q+ 43. Nxh1 Qxh1+ Bye-bye, Knight. And farewell, Pawn; though your time as Queen was brief, you performed your duty admirably. Now I must admit I was in two minds here: should I go for a Queen vs Rook endgame right away, on the kingside, or should I first try to demolish White's pawns and coast to a victory? A quick visit to Wikipedia suggested complications with the first approach, so I decided to target White's pawns. But can we get the White Rook off the second rank? As a famous man once said, "Yes, we can!" 52. ... Qd1 Putting paid to any hopes of the rook returning for defence duties. 53. Re5 Qc2 54. Rxd5 Qxb2 55. Rd3 Qxa3 Ser Arthur Dayne in action again. 56. Kf3 Qb2 57. c4 a4 58. c5 a3 59. c6+ Kc8 60. Re3 Got be careful here, danger of an Oberyn moment by 61. Re8#. I had gotten hold of Jeremy Silman's excellent How to Reassses Your Chess a while back, but couldn't make much progress, the main reason being that the reading/learning process was not very satisfactory: you need to read the book--holding a 658-page volume in one hand is no joke--while simultaneously playing the moves (and all their variations) either mentally, with a physical chessboard, or with a software program/app. While smartphone apps address the last bit (I use Analyze This for this), setting up the position for each diagram or situation in the book and making your way through the maze of variations (there is a fundamental representational impedance between a two-dimensional tree of variations and their linear representation on a page) is very off-putting. Which led me to wonder how much simpler my life would be if I could point my phone's camera at a diagram in the book, click a picture, and end up with a ready-to-analyse FEN. Enter Chessify. Exactly what the doctor ordered. Have a specific target number of pages to cover in a day. Don't try to overdo things by cramming in too many pages; my magic number is three pages, for example. Having said that, don't skip days, either; have the mental discipline to do three pages, no matter what. Here's where having a low target number helps. If a section starts out with the initial moves of a game, lays out the position in a diagram, and then goes on to the analysis, skip the initial moves (your job is to get the crux of the section, i.e., the analysis, and not the opening). Scan the diagram using Chessify, and share the FEN to Analyze This. If there are no initial moves, but just a diagram, point your phone's camera right away. Complete the set up of the above position in Analyze This (which side to move, castling options, and so on), and then play out the moves (taking time to, uh, analyse things), while skipping the variations as mentioned above. Remember to send a share of your prize money when you win your first tournament after following this method. I am fine with anything above 10%. 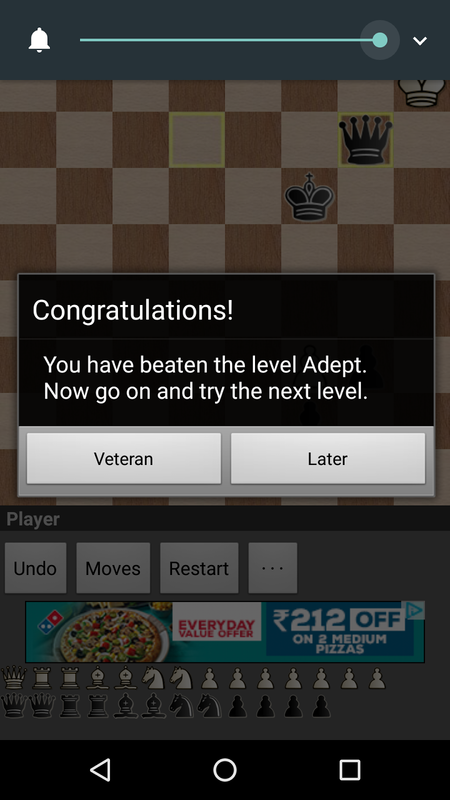 On a related note, my game has already improved so much that I recorded my first victory over the computer (the Chess Free app, to be more precise) in Adept mode. More on this later. An anonymous reader writes: The social network is getting aggressive with people who don't log in often, working to keep up its engagement numbers, Bloomberg reports. Sample this for instance: It's been about a year since Rishi Gorantala deleted the Facebook app from his phone, and the company has only gotten more aggressive in its emails to win him back. The social network started out by alerting him every few days about friends that had posted photos or made comments -- each time inviting him to click a link and view the activity on Facebook. He rarely did. Then, about once a week in September, he started to get prompts from a Facebook security customer-service address. "It looks like you're having trouble logging into Facebook," the emails would say. "Just click the button below and we'll log you in. If you weren't trying to log in, let us know." He wasn't trying. But he doesn't think anybody else was, either. "The content of mail they send is essentially trying to trick you," said Gorantala, 35, who lives in Chile. "Like someone tried to access my account so I should go and log in." Yup, can confirm this: the same thing happened to me, including the "someone tried to access my account" bit, prompting me to log in after something like ten years. Coincidentally, I was just about to set up our sensei's page in Facebook, so the reminder turned out to be useful. I am now officially back in Facebook, liking folks' posts and updates with not-so-gay abandon. Let's see how this goes. P.S. If you liked this post, please click on the Facebook 'share' button below. Just kidding.